Home » Yoga Thoughts » Happily Ever After. I’ve never done endings well. As a child, I’d fall to pieces at the end of every family reunion – sobbing in the car as we pulled out of my grandmother’s driveway for the long drive home. I’d be too sad to help take down the Christmas decorations, choosing instead to mope in my room. As a young adult, while my friends were jubilantly celebrating the last day of school, I could be found in my dorm room mourning the end of the year. Looking back, however, it’s not my embarrassingly emotional response to endings that I most regret. It’s the wasted moments leading up to these endings. It’s the lost last days of every single family reunion when I allowed the pending ending to dampen my joy at being with my cousins. It’s the moments I could have shared with my parents lovingly packing up Christmas treasures as we watched the Rose Bowl Parade had I not fled the scene of the holiday’s close. It’s the last parties, heartfelt “Have a good summers!” and parking lot hugs that I missed out on because I had retreated alone to my dorm room. Sitting here today remembering all these endings, I find myself shaking my head. There was just no reason to allow the fact that an ending was approaching to cut short all these really good stories. In focusing on “The End,” I managed to skip over the most important words of every fairy tale I ever read and loved – “They lived happily ever after.” After all the drama, all the lowest of lows and highest of highs, all the wonder and all the suspense, what I loved most about these stories was that the characters lived on. While one story of their lives was ending, they didn’t end. 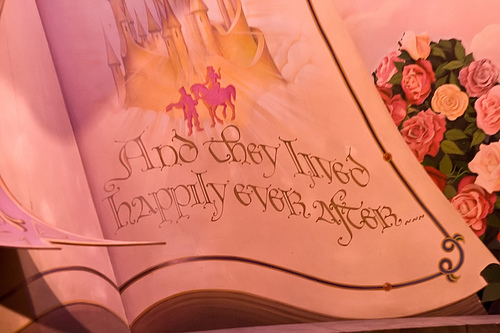 In fact, in my imagination, “happily ever after” was filled with story after story, each as good as the one I’d just read. “Happily ever after” was just a doorway into more life. In short, to miss out on the last breath of any posture is to miss out on 20% of my experience in it. When something gives me as many gifts yoga does, there’s absolutely no good reason to carelessly turn down a fifth of them. Each time I catch myself slipping out of a posture early, I have the opportunity to practice staying in the moment. Better yet, I can work on catching myself when I’m mentally or physically preparing to leave a posture during my last breath. Each time I allow my mind to wander ahead to the fact that a posture is ending, is a chance to refocus myself on the experience I’m actually having. After all, no matter how short-lived it might be, it is absolutely worth my attention. All this practice pays dividends off my mat. While I may not always succeed in keeping my emotional response to endings at bay until the ending actually arrives, I’m getting better at catching myself when sadness creeps into my heart prematurely. I’m getting better at refocusing myself on the often wonderful experiences that lead up to each ending. Whether it’s an “easy” ending like the satisfied last steps in a challenging project I’ve been working on for nearly a year or a “hard” one like the long series of “lasts” that make up my child’s senior year of high school, I find that I can practice my yoga off my mat. And, in doing so, I’m much less likely to miss out on the moments that fill these endings. Even better, I’m finding that with a deep breath like the ones I take on my yoga mat, I can lift above my sadness to remember that these endings, like the endings of the stories of my childhood, are simply doorways to more stories –– to more life. And, because this is my story rather than a fairy tale, I remember that I actually get to see what “happily ever after” looks like.